Our bodies weren't meant to sit for hours a day and we've all heard how sitting at your desk all day can have a negative affect on your health. However, you may not want to stand all day either. That's where the height-adjustable desk comes in. Sit-to-stand desks give you a seamless transition between sitting and standing throughout the day and gets you moving at work. 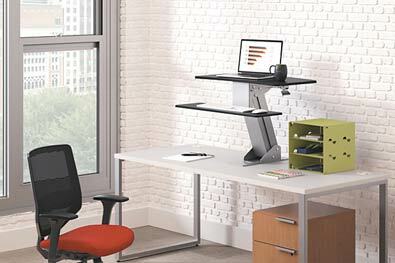 With the push of a button or by simply lifting up on the unit, you can easily go from sitting to standing at your desk. There are many benefits to using a sit-to-stand, or adjustable-height desk. They Increase movement, comfort, and satisfaction and workplace wellness. Alternating between sitting and standing throughout the day can also boost the productivity and mood of employees and reduce the negative effects of sedentary behavior. 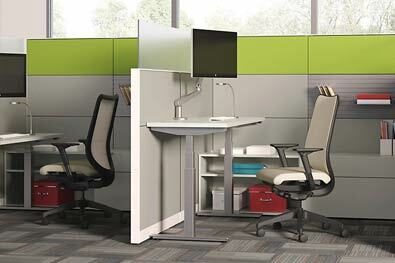 Workspace Solutions carries a variety of sit-to-stand options including electric standing desks, adjustable-height converts that work on existing desk tops, desk-mounted options, and full desk options. Supporting the increasing popularity of adjustable-height standing desks and tables is becoming a crucial element of today's organizations. 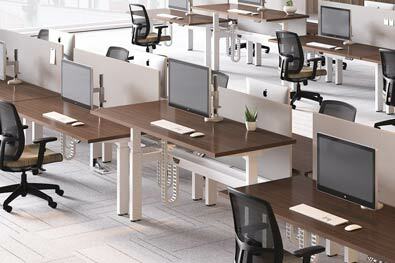 That's why Workspace Solutions in Fort Wayne carries a variety of options from some of the top office furniture manufactures in the United States. From private offices to collaborative or open spaces, we have a stand-up desk perfect for your needs. We can even convert your existing desk to a standing desk. We even have active movement seating options that work great with adjustable-height desks. Visit our office furniture showroom on Production Road in Fort Wayne today to view our sit-to-stand options and let us help you find out which one is best for you and your team. Go from seated to standing at the push of the button with an electric standing desk. Alloy benching by National is a lighter scale benching series that offers options to meet the demands for seated and standing height workspaces . 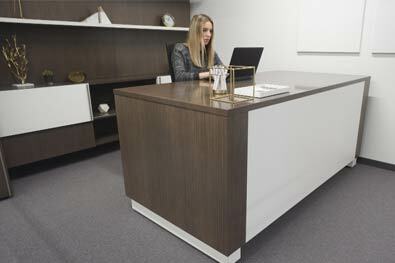 Tessera’s unique adjustable-height executive desk adds extra flair and functionality to a private office. The desk raises and lowers with an easy to use keypad and reveals complementary or contrasting legs, while concealing the lift mechanism. Raise your worksurface to new heights for standing tasks or intermediate heights to accommodate personal preferences. Altitude's height-adjustable tables are available in a variety of tabletop shapes. Your desk effortlessly raises and lowers allowing for a change in posture throughout the workday. Easily transform your desk to a height-adjustable desk with Quicksand by Humanscale. QuickStand makes sit-to-stand easy and portable. With the ability to move with or independently of the screen, QuickStand’s lightweight platform allows the desk to adapt to the user’s changing comfort demands. Unlike other height adjustable solutions on the market, QuickStand can effortlessly be moved from one work surface to another. QuickStand Eco features simple setup, portability and near effortless adjustability — transforming ordinary desktops into healthy, active workspaces. 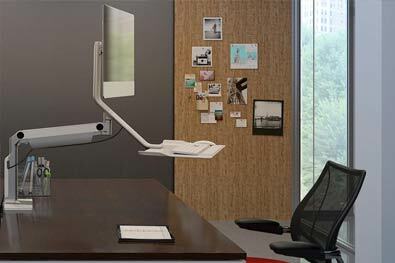 QuickStand Lite by Humanscale easily attaches to an existing desk. Its effortless functionality encourages users to build more movement into their daily routine for long-term health. Rise to any occasion and achieve the exact worksurface height you desire with Coordinate by Hon. Coordinate's height-adjustable base includes a motor-activated lift that attaches to any HON worksurface between 48"-72"wide. Whether it’s an open plan, private office or training room, these bases adapt to any workspace layout or need. 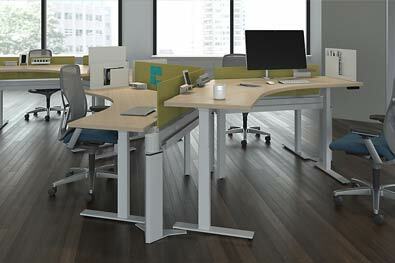 Transform your static desk into into an engaging and active sit-to-stand solution. Directional by Hon adds height-adjustability to any 20-30” deep worksurface, and can effortlessly be moved wherever its needed. Whether you need it to accommodate a laptop, single or dual monitor arms, each Directional model includes a large platform for laptops and monitors and a smaller surface for the keyboard and mouse. This frees up valuable space for work and personal items, while creating a sit-to-stand desk that promotes a healthier work style.